Yesterday, the U.S. Department of Commerce reported that capital goods orders declined 4.4 percent during August, as compared to the same period a year ago. This is a very important development because many sectors of the economy are closely tied to the production of durable goods, including industrial total output, profits, and the employment situation. When consumers become less confident about their employment situation and the outlook for the economy, they tend to reduce their spending on durable goods — on items such as automobiles, household furniture and appliances, and TVs. In turn, corporate profits at industrial firms tend to fall and companies that operate in this important economic sector tend to cut their workforce. Factoring our spending on military defense equipment and aircraft (which tend to be quite volatile and not indicative of an economy's underlying strength), new orders for durable goods fell for the fourth month in a row. 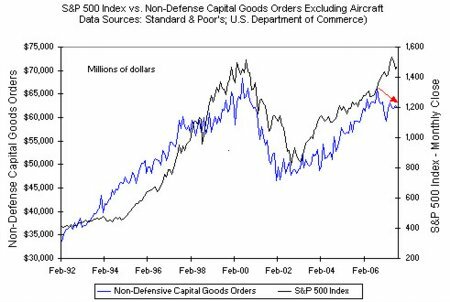 As you can see in the chart below, stock prices in general also tend to decline when non-defense capital goods orders excluding aircraft trends lower. For example, the S&P 500 Index fell 8.8 percent between January and March 1994 after this indicator topped out in December of that year. And the S&P 500 declined a whopping 22 percent between June 2000 and January 2002, following a 32 percent drop in this key leading economic indicator. With the housing market still in a slump and consumer spending declining during August for the second consecutive month, a slowdown in the industrial sector may be the last shoe to drop before economic growth in the U.S. all of a sudden comes to a halt. And, in light of the ongoing credit crunch, tightening bank lending standards and extremely high consumer debt levels, my research strongly suggests the Federal Reserve won't be able to stimulate growth merely by lowering short-term interest rates. Hence, even if the Fed does cut rates again at its next meeting on October 31, the only outcome may be more inflationary pressures. So, although stock prices have held up quite well over the past week, after the Fed cut the target Fed Funds rate by 50 basis points last Tuesday, I strongly urge you to not become complacent about the future direction of stocks. If you're interested in hearing more from me on this subject and to learn how to profit from a slowing economy and rising inflationary pressures, Click here for a trial subscription to our new investment newsletter letter — The ETF Strategist.